Discover the secrets of the Madonna of the Yarnwinder (The Lansdowne Madonna) as revealed by a number of ingenious scientific techniques by selecting a type of analysis from the drop-down menu on the right. These techniques harness the very latest advances in modern scientific analysis to produce several alternative “portraits”, each of which tells us ever more about the way the painting was executed. They have even revealed much about the life of the painting, in terms of conservation and restoration, after Leonardo’s death. 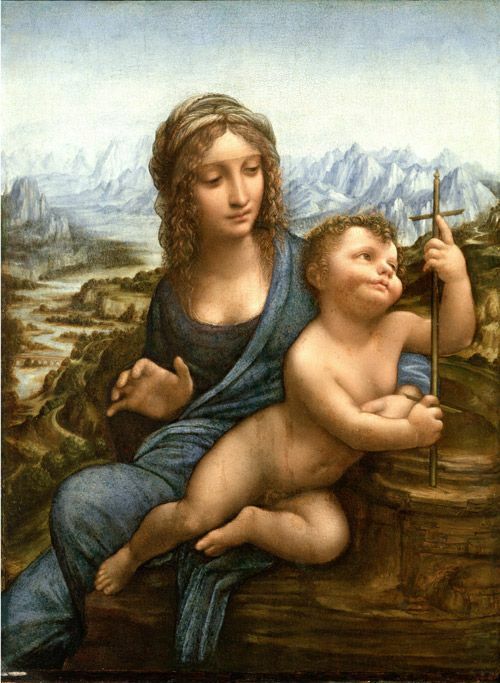 As part of the Universal Leonardo programme, the Madonna of the Yarnwinder (The Lansdowne Madonna) has been exposed to eight separate forms of technical examination, the results of some of which are displayed here. These techniques were non-invasive (requiring no samples to be taken from the picture) and are as follows: X-ray radiography; ultraviolet analysis; IR-RGB scanning (which encompasses infrared reflectography, colour scan, mixed colour with infrared and false colour); X-ray fluorescence (XRF); particle induced X-ray emission (PIXE and PIGE); fibre optics reflectance spectroscopy (FORS); profilometric analysis; and Computed Axial Tomography (CAT) scan. The application of these modern scientific techniques of analysis to Leonardo’s work has given us a glimpse into the mind of a true genius at work. Perhaps the most visually impressive results achieved using some or all of these techniques have been those realised with the IR-RGB scanner, which was developed by the National Institute of Applied Optics (INOA-CNR) in Florence, Italy. All the examinations have been carried out under the direction of the Opificio delle Pietre Dure and the crucial collaboration of institutions such as the National Institute of Applied Optics, the National Institute of Nuclear Physics, the Institute of Applied Physics (IFAC-CNR), the Careggi Hospital, all in Florence, Italy, and the Italian branch of the Siemens Group.